Located in southwest China, YunNan is a highland plateau province with countless of scenic attractions, as well as over 20 ethnic minority nationalities. 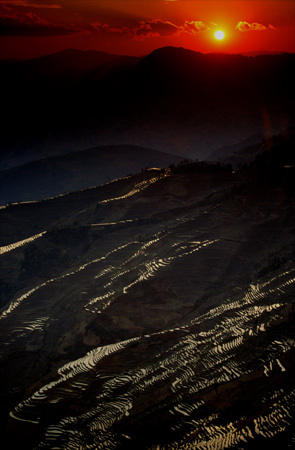 Very southern YunNan, the county of YuanYang, is known for its unique centuries old rice terraces. These terraces built by local farmers on the mountains all the way from couple hundred meters to 2,000 meters high elevation. They are likened to be the sculptures of the mountain. Showing the struggle and the harmony between human and nature.